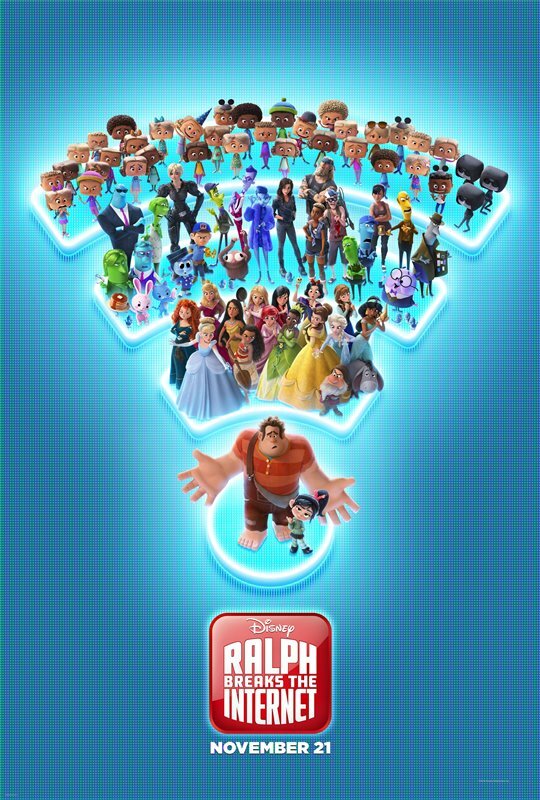 Six years after the release of Wreck-It Ralph in 2012, the video game characters return for a new adventure in Ralph Breaks the Internet. This time around, best friends Ralph (John C. Reilly) and Vanellope Von Schweetz (Sarah Silverman) venture into the world wide web, and the results are equal parts fun romp and surprisingly serious cautionary tale. Ralph and Vanellope have settled into a stable routine together, spending every day in their respective games, before meeting up every single night to hang out, visit other games, and have root beer at Tapper’s. While Ralph is perfectly content following this routine, Vanellope is getting tired of the mundanity of it all and is looking for something new. Looking for a way to shake things up for his friend, Ralph decides to make a new race track in her game Sugar Rush, but this creates chaos and causes the plastic steering wheel on the arcade unit to break in half when kids are trying to control it. The only place to get a replacement wheel is on eBay, but the cost of it is far too high and much more than the old game even makes in a year, so Mr. Litwak (Ed O’Neill) decides it’s time to just retire the game, leaving Vanellope gameless. But Mr. Litwak has also just plugged in a new portal called Wi-Fi, so Ralph and Vanellope decide to take matters into their own hands, and venture into the world of the internet to track down the replacement part by visiting eBay themselves. It’s here that they stumble into a new world that resembles a bright, Tokyo-style metropolis, which couldn’t be more different from their old school arcade games. Looking for a way to get enough money for the wheel, they soon end up in an online game called Slaughter Race, where players try to steal a car from the badass lead driver Shank (Gal Gadot), which gives Vanellope a taste of the excitement that she no longer gets from her more childish racing game. While Ralph wants to return to their quiet life and same old routine, Vanellope is completely taken by the bustling world of the internet and wants to stay, which drives a wedge between them. One of the best things that can be said about Ralph Breaks the Internet, which happens to be only the third theatrically released sequel from Walt Disney Animation Studios following The Rescuers Down Under and Fantasia 2000, is that the film doesn’t feel like a mere retread of its predecessor. While this is a direct continuation of the first film that works as a complimentary counterpart to it, this sequel also very much tells its own story, and goes deeper into exploring the friendship between Ralph and Vanellope. There are appearances from previous favourites like Fix-It Felix Jr. (Jack McBrayer) and Sergeant Calhoun (Jane Lynch), but the story mostly focuses on these two main characters, and sees them interacting with a variety of new supporting players. Along with the aforementioned Shank, these include Yesss (Taraji P. Hensen), a stylish algorithm who works for the video sharing site BuzzzTube, and helps Ralph go viral in hopes of getting enough likes, which will translate into ad dollars that they can use to pay for the steering wheel; and KnowsMore (Alan Tudyk), a purple, egg-shaped character who wears a graduate cap and works at a search bar, complete with an “aggressive” autofill function. KnowsMore’s eyes are hand-drawn, which gives him a really interesting look that recalls classic cartoon characters from the 1950s and ’60s. The attention to detail throughout the film is incredible. They brought in the stunt co-ordinators from Baby Driver to help choreograph the car chases scenes in Slaughter Race, and Gal Gadot’s character also bares a striking resemblance to the Wonder Woman actress, with the animators adding in many of her own mannerisms after watching footage of her in the recording booth. They also brought in a world champion auctioneer from Illinois named Brian Curless, who had never even been to California, to voice one of the sellers in eBay. To make him feel more comfortable in the recording booth, the filmmakers actually pretended to be bidding on items while he was delivering his lines. Maybe the film’s best sequence, and certainly the one that has become the centrepiece of its marketing campaign, comes when Vanellope finds herself in the fan website Oh My Disney. It’s here that we get cameos from some of the studio’s other beloved characters, (Nick Wilde and Judy Hopps! ), including every single one of the Disney Princesses. It’s cool to hear most of the original voice actresses reprising their roles, and the film has a lot of fun subverting stereotypes about each of the characters in a scene that will be pure joy for any Disney fan. There’s even a full-on musical number, featuring a new song by the one and only Alan Menken. The film certainly shows the fun side of the internet, but it also explores a lot of more serious themes about modern technology, and how the internet has effected and changed our relationships with other people, not always for the better. When I heard producer Clark Spencer speak at Fan Expo a few months ago, he talked about how they really felt a responsibility to show both the good and bad of the internet, and without giving anything away, this leads to a gut-wrenching scene involving a comments board that heartbreakingly shows the effects of cyber bullying. We are even taken to the disturbing corners of the Dark Web, which is presented as a dystopic wasteland of hackers and trolls. As it goes along, Ralph Breaks the Internet actually becomes something quite complex and challenging in how it explores the changing friendship between Ralph and Vanellope, with Ralph’s own insecurities having caused him to become almost possessive of her. The film could ignite a lot of important if uncomfortable conversations about internet stalking and toxic friendships, but I do have some mixed feelings about a few of the places where the story ends up. At a certain point, Ralph’s behaviour crosses the line from being caring and overprotective to stalkerish and creepy, and one could reasonably argue that the story actually ends up sending a bit of a conflicted message. But I also trust co-directors Rich Moore and Phil Johnston enough to assume that the more troubling nature of what transpires was intentional, and meant to spark a difficult debate about what to do when friends start to want different things and their relationships become imbalanced. The film is beautifully animated and often really funny, but there is also real heart to the story, with Reilly and Silverman once again delivering nuanced vocal performances, and this more serious side is what allows Ralph Breaks the Internet to linger afterwards. Oh, and the film also features two of the best end credits stingers of all time, so you’re gonna want to stay right until the very end.